We offer more than just custom wood doors; we offer custom steel doors for garages. We’ll work with you to create the perfect garage door made from your preference of materials. 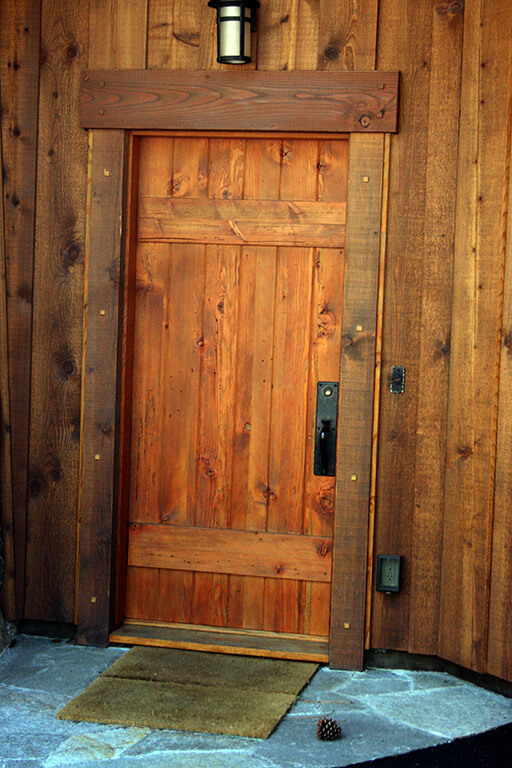 If you’re ready to design your dream door, call us at 530-587-1993 today or come visit our showroom in Truckee. If you’re looking for a custom entry door that’s extremely weather resistant, our fiberglass doors might be a good option. Because we manufacture craft doors, we can create a high-quality, professionally designed and styled fiberglass door for your residence. Refuse doors are required for residences that live in bear country. Bear proof doors aren’t known for their fashion, but that doesn’t mean they have to be tasteless of style. Let us help create tasteful refuse doors for your property. Whatever type of door you’re looking for, you’ll find high-quality options for custom front doors and custom back doors at our showroom in Truckee. Craftsman double entry doors have always been a favorite amongst our customers. Arched double doors come with the option of a wooden entry system, including sidelights and transoms. We are happy to accommodate any and all requests for custom exterior doors. The demand for prehung Rixon Pivot entry systems has increased in recent years as this type of custom exterior door has gained in popularity. Fire rated doors are readily available and typically required by code when transitioning from the main living area into a garage. We offer 20-minute, 45-minute, 60-minute and 90-minute fire rated doors. Our fire rated doors can be designed to match the type and style of doors in your residence. Exterior wood doors can be made using any specie of wood. Take a look at all of the wood types we offer. When deciding on what type of wood to use for your custom exterior door, consider whether the door will be placed in a high traffic area and determine the level of exposure to natural elements. Different wood types offer different levels of durability. Sun and moisture can cause finishes to fail in wooden doors. This can ultimately lead to the separation of joints within the grain of the wood; destroying the door. Extreme temperatures can cause wood doors to warp; producing problems in sealing. We’re the go-to custom door makers around Lake Tahoe, California. Call us at 530-587-1993 today or come visit our showroom in Truckee to start designing your custom entry doors.